Once the root cause(s) have been identified, the team establishes an action plan on the permanent actions to be taken. Again, the action plan includes who will do what by when. The permanent actions are implemented to solve the problem. The question �Why did this occur?� must be answered. Establish ongoing controls on the process to ensure the process remains in control. 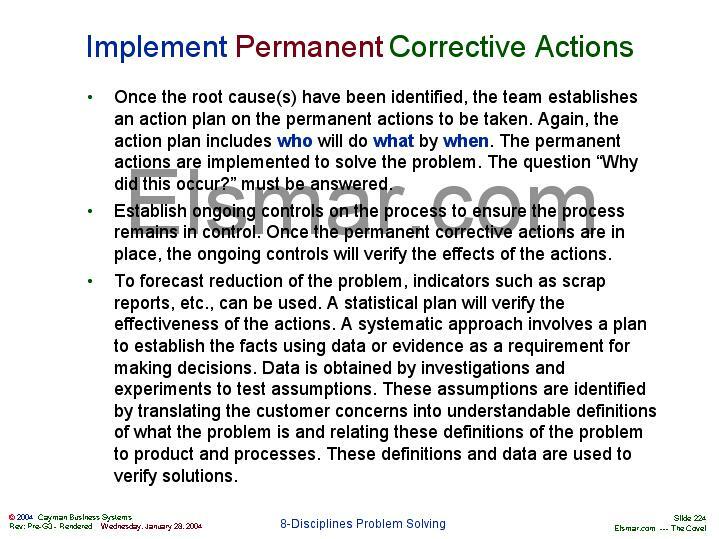 Once the permanent corrective actions are in place, the ongoing controls will verify the effects of the actions. To forecast reduction of the problem, indicators such as scrap reports, etc., can be used. A statistical plan will verify the effectiveness of the actions. A systematic approach involves a plan to establish the facts using data or evidence as a requirement for making decisions. Data is obtained by investigations and experiments to test assumptions. These assumptions are identified by translating the customer concerns into understandable definitions of what the problem is and relating these definitions of the problem to product and processes. These definitions and data are used to verify solutions.